But they do happen from time to time. Agnes (June 1972) sticks out in my mind. It goes in the record books as my first hydrologic memory, not as a Floridian – where it made landfall, but as a native Marylander where I was born, and where the storm passed through on its way up the Atlantic Coast. I was only 3 years old at the time. My mother and father judiciously had us take cover under ground, not for the reason we didn’t have shutters on our windows – we did, but because those shutters were fake! 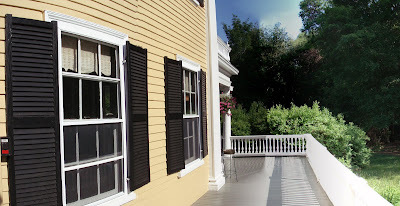 The so called "ornamental shutters" were made of flimsy plastic, manufactured too narrow to cover the full width of glass, and – the final insult – drilled permanently into the wall siding. They looked great on a sunny day, but that was about the good of them! But Marylanders are nothing if not innovative: we found safety in the basement … and after the storm passed, also found a thin sheen of water on the slab floor. That discovery marked the beginning of my father’s futile attempts to battle a chronic moisture problem in our basement, predictably ending each time with him admitting defeat (tinged with a sense of awe) to the subterranean river that coursed beneath our house.